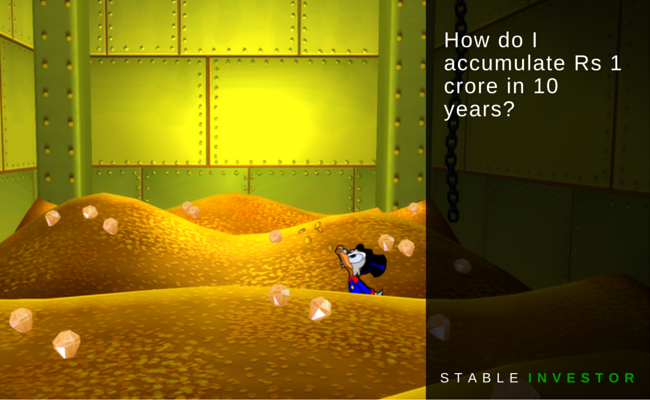 How do I accumulate Rs 1 Crore in 10 years? I was really happy to see the brutal honesty of the reader. Isn’t this exactly what all of us want? Least risk – Minimum investments – Maximum Returns. Wouldn’t our lives be financially perfect if we could achieve the above 3 conditions by investing in just one product? Now if the reader had a time-horizon of 15 years, I would have suggested PPF. But even that has a limitation that I will just come back to in a bit. Putting roughly Rs 27,000 a month in this least risk instrument for 15 years would have created a corpus of Rs 1 Crore after 15 years. Now this is assuming that PPF rates stay at atleast 8.7% for next 15 years. But as already mentioned, the limitation of this brilliant instrument (PPF) is that it does not allow an investment of more than Rs 1.5 lacs in any given year. So Rs 27,000 a month cannot be invested in PPF. Also the tenure is 15 years. So PPF is out of question for the reader. The tenure here is 10 years. So even if some instrument gives a post-tax return of 8.7% in 10 years, then it will still create a corpus of only Rs 51 lacs (for a contribution of Rs 27,000 a month). That’s a solid 49% less than what is required. To achieve Rs 1 Cr from a 8.7%-assured-return-instrument, monthly contribution has to be around Rs 53,000. Coming back to the question of accumulating Rs 1 Crore in 10 years. So either the monthly contribution needs to go up (from Rs 27K @ 8.7%), or the return expectations need to go up (and with it, the risk being undertaken). In this particular case, I think both will have to be increased. So if the reader is willing to move away from his low-risk strategy (which he should, considering a long enough time horizon of 10 years), then things can actually work out. Now I am not sure what amount the reader can comfortably manage to invest every month (He did not provide me with other details). But I am assuming that if he intends to save a big 8-figure corpus in 10 years, he will acknowledge the fact that he would need to make some sacrifices today. That’s how personal financial related mathematics works. With that settled, lets focus on the expected returns. PPF delivers 8.7%. Any instrument that gives lesser is not worth discussing here. This leaves us with the task of choosing a suitable rate of return, which is higher than 8.7% and which is more importantly, realistic. Equity MFs have delivered returns exceeding 15% in past. But expecting them to do so in future is a little risky. Its best to tone down expectations to a lower level – I personally prefer 12% – my favorite in calculations (my worst case scenario for equity MFs is 10%). I have seen many bloggers and financial planners choose 15% and even 18%. My best wishes to them. 🙂 If it happens, then it will be great for them as well as for me. But if it doesn’t, they will end up with a lower corpus, not me. Why? Because my return expectations are much lower at 12%. This means that I will be making a higher monthly contribution, which will ensure that I will achieve the target corpus even if the actual returns achieved are less than 15% (but ofcourse more than or equal to 12%). 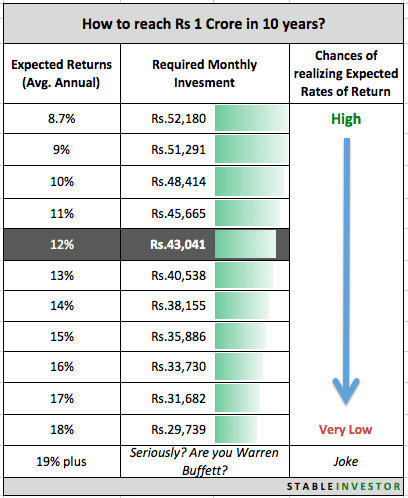 So with 12% expected returns, what is the required monthly investment for next 10 years? Simple excel calculation shows that to create a Rs 1 crore corpus after 10 years, the reader needs to invest Rs 43,000 a month (for 120 months) and hope that fund gives an average returns of 12%. Now as you can see above, higher the return expectations, lower the required monthly investment. But problem with high expectations is that they are hardly met. So even if some equity funds have managed to deliver 15% in past 20 years, it is difficult to guess what returns these funds (or other funds) will give over the next 10 years. So by keeping our expectations low, the chances of ending up with less than Rs 1 crore are further reduced. But here is a very important point to note. Agreed that Rs 1 crore is a lot of money. But after 10 years, the value of this amount won’t be equal to what it is today. And unfortunately, many people don’t realize this. Just to give a rough idea, a crore rupees today would be worth only Rs 40 lacs to Rs 50 lacs after 10 years. So as a reader, you need to keep the time value ofmoney in mind when doing such calculations. Previous Entry Yes. Buying Health Insurance protects Your Wealth, not Health.